Now that I’m getting up early with a baby every morning, I’ve been looking for places with quick breakfast options. Most of the time, I just go to McDonalds because I’m a really big fan of the Bacon, Egg, and Cheese Biscuit. Most people are addicted to McDonalds fries. Not me. I love the breakfast sandwich. 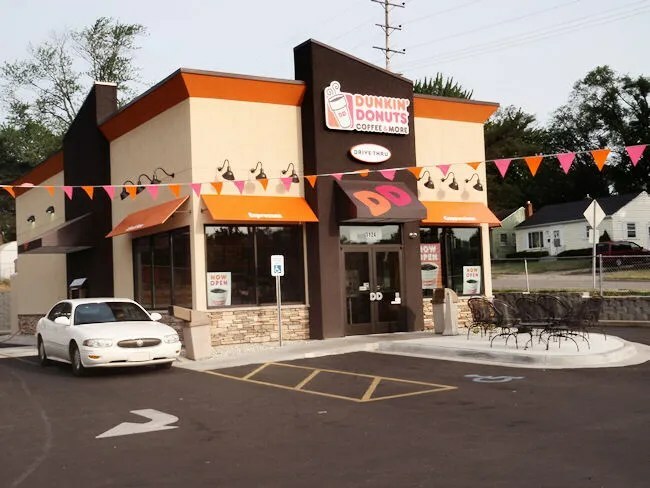 A couple months ago, J found out that Dunkin’ Donuts was opening a new store on South Westnedge at the corner with Whites Road behind Jimmy Johns. I grew up with Dunkin’ Donuts. 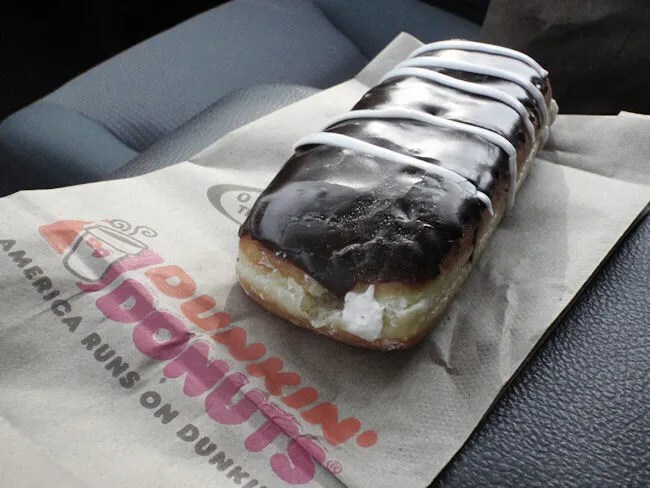 It used to be a real treat to get Dunkin’ Donuts instead of the typical gas station long johns. Things have changed quite a bit since my childhood. Dunkin’ Donuts is so much more than just doughnuts. Today, it’s more like a coffee shop that happens to have donuts. Almost half their sales is coffee. I’ve never been a coffee drinker, but most of my friends would rave about Dunkin’s coffee. When I lived in Peoria, one friend would make me take him there after a night of drinking. He would get coffee. I would get a long john. The first of what could be three Kalamazoo locations opened on July 2. It took me four whole days to actually work up the energy to get going in the morning and make it over there. L and I needed to go grocery shopping and even though it was way out of the way, I wanted to get breakfast. 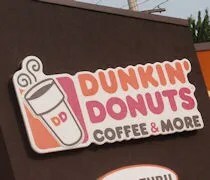 The newer Dunkin’ Donuts are nothing like I remember from growing up in East Central Illinois. At that time, Dunkin’ Donuts were just doughnut shops. There was a counter with a large rack of doughnuts to pick from. The new Dunkin’ Donuts are more like little cafe’s. There are a number of tables in the lobby of the Westnedge location and the doughnut section is actually pretty small. In addition to coffe and doughnuts, they’ve also entered the breakfast sandwich market. That is what I was really interested in testing out. The drive through, which is open 24 hours, had a line wrapped around the building so I parked and headed in. The dining room was pretty empty, so I stepped right up to the counter while I was looking at the large menu boards hanging from the ceilings. I really didn’t know where to start and after talking to J, it sounds like they have a lot of tasty sandwiches. This Dunkin’ location is pretty close to her work and they’ve already made multiple trips in the week it’s been open. 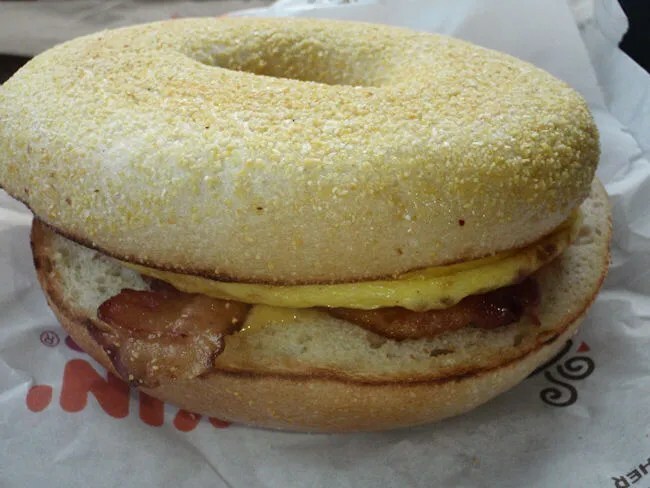 I stuck to what I usually like and ordered the Bacon, Egg, and Cheese bagel. I see now you actually have choice of bread and I probably would have picked something other than the bagel had I known, but that wasn’t really easy to spot on the menu in the restaurant. In addition to the sandwich, I had to get a doughnut. I looked around the cashier to see what they had. I was baffled to not see a vanilla long john, so I asked. Both ladies behind the counter said they didn’t have it and they’ve been surprised by how many people have been asking for it. Not sure if it’s something Dunkin’ doesn’t do anymore of if this store just hasn’t made any. I was really wanting that vanilla long john, so I was a little disappointed to have to pick something else. I let the cashier talking me into a chocolate long john with vanilla filling. he charge was just under five bucks. The doughnut was bagged up and handed to me right away while the sandwich took a few minutes to come up in it’s own separate bag. When I got back in my truck, I started with the doughnut. It was alright, but it wasn’t the vanilla long john I wanted. It’s hard to imagine that if Dunkin’ depended only on its doughnuts they could compete with Sweetwater’s. I only ate about half then tossed the rest out the window for the birds. I’m not a big chocolate frosting fan, so that was probably more of the reason I wasn’t super impressed with it. The sandwich, on the other hand, was pretty good. On a croissant or a biscuit, this sandwich would have probably been even better, but it was tasty, bigger, and cheaper than a similar sandwich from McDonalds. The talk is one of the next Dunkin’ franchises will be on the West side and if that happens, I would eat this sandwich often. As it is now, I will still occasionally make the trip to the south side of town because this is definitely a good alternative to the Bacon, Egg, and Cheese biscuit I love so much. Being someone who grew up on Dunkin’ I’m a little surprised at what it has become. I like what it is, but doughnut wise, they will never beat Sweetwater’s. If I’m there for a sandwich, I’ll probably pick up a doughnut just because it’s convenient. For coffee fans, this is going to be a great thing. For non-coffee drinkers like myself, there are still a number of great sandwich options.